The marshes of Southern Iraq were once the third largest wetlands in the world. The Tigris and Euphrates cross on the eastern edge, so the Mesopotamian marshes are thought to be a site of the historic Garden of Eden. The Marsh Arabs, lived an unchanged way of life for over seven thousand years there, until the early 1990s, when Saddam Hussein drained and burned the wetlands to flush out Shi’ite rebels. Thousands of people were murdered or driven out and flora and fauna devastated. With Saddam Hussein’s demise in 2003, people started returning, with simple hand tools, to break through the earthen canal and let the waters back into the desiccated land. 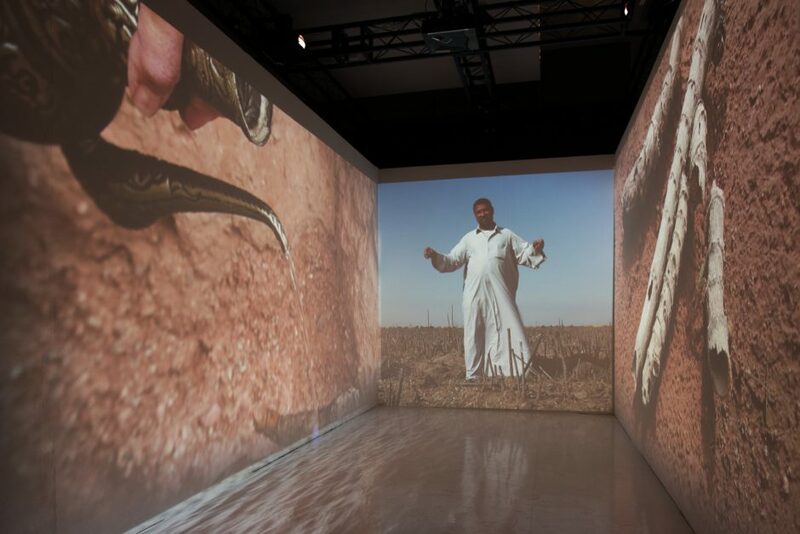 This video is a celebration of the return and immerses the viewers in the wetlands the Marsh Arabs cherish. The video installation, in a rectangular space, is a 4-channel 9.47 minute video loop.